The cover bike is the Money Bagger built by Kory Souza Originals! We also feature the Agitator (built by All-N-All Custom Baggers); John Capalbo/Cylent Cycles 2003 Road Glide (built by Cylent Cycles); Full Throttle Express (built by SinWorx); and Orange Crush (built by Victory Motorcycles of Citrus Heights). We also have lots of coverage of the Baddest Bagger in Panama City, new products, and Buyer's Guides: Electronics & Lighting. 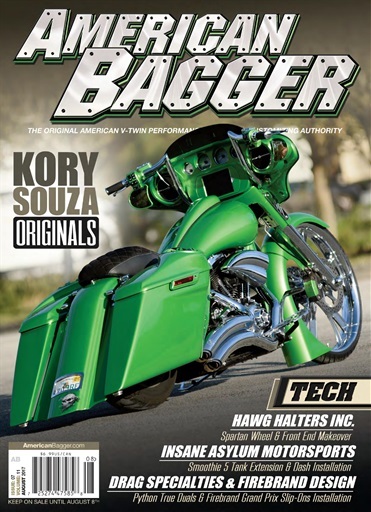 Our tech shop features articles from Hawg Halters Inc., Drag Specialties & Firebrand Design, Insane Asylum Motorsports, Feuling, and Paul Yaffe's Bagger Nation.